This week at The Friday Mashup we have a sketch along with a Back to School theme. My kids headed back to school on Aug.17, I have a senior and junior this year. Time sure flies! I'm not a big fan of back to school cards, I never had any out, so I went with images that remind me of fall and back to school, like apples. I'm also thankful that my kids are back in school, hehehehe, but I'm also thankful for some of the great teachers they have so hence the thankful sentiment. I mixed a bit of old with the new on this card. The DSP and card base color of Lucky Limeade are all retired, along with the ribbon, but the sentiment and bear are brand new images that are in the Thankful Forest Friends, which can be found in the new SU holiday catalog. I colored the image stamp with various markers and stamped in on a piece of Very Vanilla. The bear was stamped in Early Espresso and fussy cut, then popped up with dimensionals. 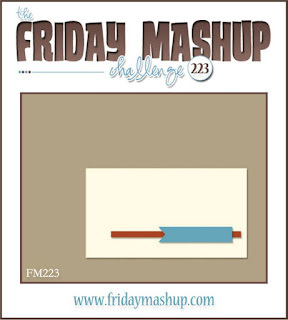 Head over to the Friday Mashup blog to see what the rest of the DT created and then play along with us! Create a project using the Sketch. Create a project with a Back to School theme. or Mash it Up! and created a Back to School project with the Sketch. This is AWESOME! You are using one of my favorite DSP packs and it goes wonderfully with the bear and sentiment! Great team challenge card.